This post marks the end of this line of pondering. I have considered three reasons that contribute to the fact that Mass attendance at Traditional Masses has plateaued in England and Wales. Recusant Mindset. Elitism. And Over-focus on the Mass. As I mentioned, the Recusant mindset is both an instinctual reaction and an ingrained historical memory for English and Welsh Catholics. It is a coping mechanism. So really the way to break out of that is to apply some of the tools of modern psychology. The first hurdle is to identify that the problem exists. Once that is identified and held consciously in mind, Grace can start working in ways it could not before. The cause of the threat is the “Catholic news” – information. Too much “bad news” creates a panic response. So perhaps a program of recovery around Catholic news obsession would be in order. Seeking a Spiritual Director would be optimal, as he would be able to advise how to carry out that recovery in practice. I would suspect a Spiritual Director would suggest abstinence from viewing and/or gossiping about “Catholic news”, as a start. A period of voluntary abstinence from all internet media, or something like that. With all that spare time, one could use it fruitfully in improving one’s personal relationship with God (ideally under guidance of a Spiritual Director). Clearing out any Grace-blocking items from one’s conscience, by careful examination and Confession. In a way, it is about living life here and now, having Faith, being Holy. How to break out of institutionalised recusancy, for instance in the cases of close-knit Traditional Communities. Maybe situations where the Priest (and therefore Spiritual Director) is also party to this mindset. Well, the recovery of the whole, starts with the recovery of the individual. But if Pastors were able to request their flock to commence a period of abstinence from Internet Media and News, that would be a great start. Then I hear the clamour “but if we were to abstain from Internet Media and News, how would we hear the good news and advice from CatholicScout? !” – well, just how many bloggers do you hear of suggesting people should abstain from reading Internet Media and News? Not many. I don’t write this blog to get “hits” or “followers”, I write it to bear witness to truths which I have learnt. I found voluntary abstinence very helpful, so I don’t read Internet media and News before 8.00am or after 6.00pm. I also freely choose not to read Internet media and News from time to time. Instead spending the time doing something fruitful, such as praying a Rosary. Most of all I keep very close to my heart the maxim written above. 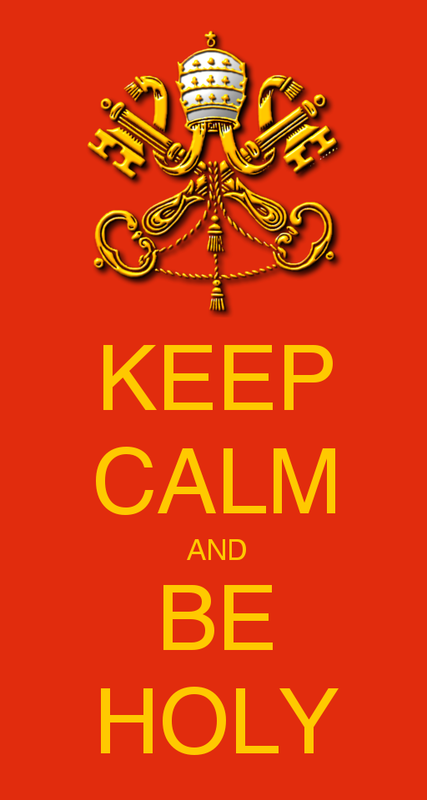 Keep calm, and be Holy. It works. Remember, ask yourself “What would Jesus do?” Would Jesus be spending His day on Facebook, or surfing for the latest gossip from Rome? No. He would be about doing His Father’s will, and as a result, be Holy. In my post on Elitism, I dealt with three manifestations, there are more, but these three are prominent enough that most people will identify them. No man can serve two masters. For either he will hate the one, and love the other: or he will sustain the one, and despise the other. You cannot serve God and mammon. Therefore I say to you, be not solicitous for your life, what you shall eat, nor for your body, what you shall put on. Is not the life more than the meat: and the body more than the raiment? Do not be solicitous. It doesn’t mean “wear a potato sack”. But if you find this level of abandonment a little to challenging, don’t just shirk away without asking for God to help you to fulfil His counsels. He will help. After having asked for God’s help in fulfilling His counsels, and having confessed your lack of faith, and infidelity to His counsels. You can always take the path of modesty. Be modest. Modesty is an off-shoot of humility. The two go together. Modesty seeks not to be noticed, think of it as Catholic Camouflage. How can I not attract attention? Bright pink socks or black socks? My best gold and green waistcoat or not? There is nothing sinful about wearing beautiful clothing. There is something very sinful about vanity. If it is for show, or to participate in a show, then it is vanity. Public show of vanity, is really an occasion of public scandal. For here, a sin is being expressed in the public. So what is the remedy for Vanity? Well, again it is abstinence first, then the practising of it’s opposing virtue humility. Does that mean wandering into Mass in tattered jeans and a t-shirt? Or flagellating oneself publicly while wearing sack-cloth and ashes? No. Firstly, abstinence. If there is an occasion of sin, one should avoid it. If there is a Mass where there is a public show of vanity, one should probably look to go to Mass elsewhere (if you have such an option!). Correction of self. The sin that needs to be corrected is within ourselves. I can only cooperate with God’s grace to save my soul. I can’t save anyone elses. So my job is not to police them out there. It is to regulate myself, by cooperating with God’s Grace. The first thing that I can recommend is getting a Spiritual Director (you will see that “get a Spiritual Director” is a running theme…) who is not part of that vain scene. It should be someone who understands that we want people to be watching Jesus, not looking around in the pews comparing. Shift your focus off you, and others, and on to the Eucharistic Lord. Modesty is the key. This is Who should be drawing people’s attention, not you. Humility. I think it will be hard for Traditional Catholic Supremacists to let go. So much energy in protecting their Mass. So many years, so much effort. But let go they must. Humility to adopt new perspectives, to accept new criticisms. Humility to try new things and new approaches. An email correspondence of mine, pointed out that this problem is very similar to a psychological phenomenon he has witnessed. He said it may be recommended if these Supremacists are in groups to humbly and honestly inform themselves of the psychological phenomenon of GroupThink and to practice the precautions regardless. Thank you for that pointer. Lastly, and this ties to the next Elitist group, transparency! No more secrecy! Humility. This out of all three, I think will be the hardest group to remedy. Detachment from money is very, very tough. Of course the Miser or Old Money Catholic could be dishonest in publishing his accounts, but that would be more coals heaped upon their head. Lastly, I think the people who find Old Money Catholic odious (which I may add, I am included), is the perception that they do not labour for their earnings (ref: 2 Thes & Gen 3). A remedy for such a person would be for them to earn a living, which pays for their bread (not relying on the fat). Transparency of accounts also would go miles to correct it. What to do with the Old Money itself though? Well I think Rerum Novarum is the way… voluntarily spread it out. Imagine if all the Misers and Old Money Catholics shook off their bonds and pooled the money to set up a Traditional Catholic Building Society, helping Traditional Catholics own property close to other Traditional Catholics? The remedy for the over-focus on the Mass, is a larger problem than the one than the others. The others, with good will, can be self-corrected. Sure sound preaching against these problems will be needed. 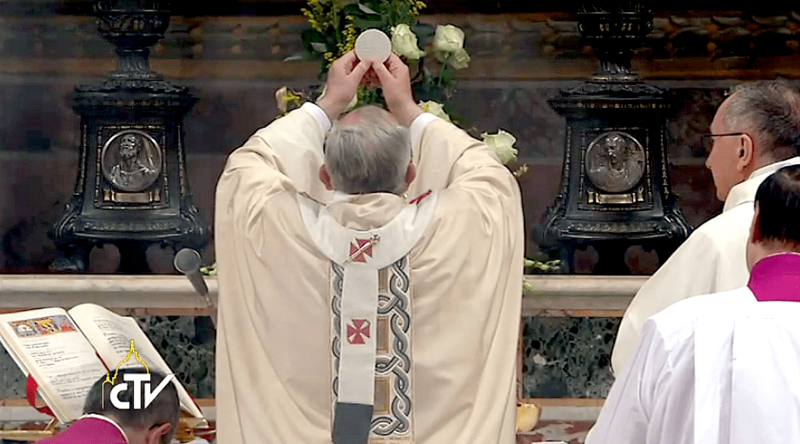 But the over-focus on the Mass is out of the hands of ordinary people. There are organisations such as FIUV, who may have the clout to express these issues, but ultimately the response lies in the Church authorities. Pope Benedict XVI promulgated Summorum Pontificum, but the Bishops ignored it. What can you do when Bishops ignore the Pope? If His Holiness Pope Francis, had a sudden blinding conversion to the Traditional Mass, and by some bizarre misdirection was reading this article, I would recommend an addendum to Summorum Pontificum. It is binding that every Diocesan Bishop shall set up at least one Church per major population centre (over 100,000 inhabitants) that is to be exclusively dedicated in perpetuity to offering the Mass in the Extraordinary Form. These Churches are to be in locations that are easily accessible to the majority of the population, close to the centre and near good public transport terminals. The Diocesan Bishop is free to invite a community to take care of the Church, otherwise he is bound to diligently provide Sacred Ministers for the exclusive celebration of the Vetus Ordo. For Traditional Priests to educate (and preach) on the Encyclicals of the Popes. Particularly Summorum Pontificum. For Traditional Priests to preach and practice more of the Traditional Devotions (Sunday Rosary, Sermon and Benediction, Procession on the Third Sunday of the Month, Weekly Thursday Holy Hour, October Devotions, Processions, public Novenas etcetera). For laity to educate themselves on the Encyclicals of the Popes. Particularly Summorum Pontificum. For Laity to practice more of the Traditional Devotionals at home and in public. For them to ask Priests to lead these Devotions. For photographers, to turn around and photograph the Nave, not too much of the Sanctuary!! Lastly, of course, in all of these, we will be battling apathy. Evil reigns when good men do nothing. Thank you for letting me know. 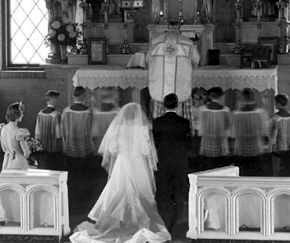 It is with sadness that I read your email about how you left the Catholic Church because of the lack of any warmth, welcome or charity that you perceived in the laity at that Traditional Latin Mass. I am very sorry to hear that you experienced what you did, and if I may, I would like to share with you some of my own thoughts. I am not trying to change your mind, but perhaps I may be able to answer “why?”. Prior to the Second Vatican Council there was a strong sense of Ultramontanism in Catholic clergy and laity. Ultramontanism is summed up by “if the Pope says it, then do it”. There was no sense of questioning something. So when the changes started occurring (not only to the liturgical life of the Church) in the early 1960s, clergy and laity to the vast majority just went along with it. Ultramontanism gave carte blanche to reformers. Now there were some people who were not so Ultramontanist, some of these people persevered for the Traditional way of doing things. What you have to understand is that these people, who said to themselves “this doesn’t feel right”, found themselves completely isolated from the vast majority who simply said “the Council said so, so do it”. Their Parish life was destroyed. What these people went through was terrible suffering. This remnant had to fend for themselves in a very hostile environment, scratching a secret Mass here or there. As Michael Davies very correctly pointed out, the situation was very similar to what happened at the beginning of the Protestant Reformation in England. The mentality of the remnant was very much “circle the wagons”. Now, the Church has admitted that the Mass was never abrogated and our Holy Father Pope Benedict XVI has opened the Mass to all and sundry. But it takes time, it takes time to heal the hurts that these people have been through, some of the hurts are disgraceful, but the worst part was they were done by other Catholics. It takes time to change mentalities, to trust again. The Church is our Mother, but these people perceived that they had been struck by their very own Mother, and only now were being slowly re-accepted. But it takes time to trust. There is a lot of wariness towards the current Magesterium, and despite the brave words of many priests, Bishops and Cardinals, the wariness remains, because actions speak louder than words. This remnant, were and often still, are a shunned people, and they, to a large extent, have lost the sense of Parish and are more used to being liturgical nomads and having to fend for themselves, not because they have abandoned their former Parishes, but rather because the Parishes they knew and loved have been taken away from them. Sadly I don’t have the time or resources available to teach attendees of Traditional Latin Masses, the maxims of Christ-like love for ones neighbour, though I try my best to live them myself. I have come to learn that those associated with the Traditional Rite, just like those associated with any rite, or religion, are a mixed bunch, saints and sinners. C’est la vie. I am sorry that you came across brothers and sisters who were suffering so, that they had forgotten simple Christian Charity to ones neighbour. I hope that you will come to have compassion on those who you perceived as cold and unwelcoming, that you will pray for them and forgive them. That perhaps you will one day come to love them and help them to rediscover the sense of Parish and welcome. Remember for the Traditional remnant, the persecution continues, all you have to do is look at the Mass listings for Christmas in England and Wales, in three Dioceses there are no Masses on Christmas day. May God bless you and keep you, always.